Full suspension mountain bikes are built for the most challenging trails and tracks. Unlike their cousins, hardtail mountain bikes, they have suspension on both front and back wheels. This can add a bit of weight, but they mean that you can ride more quickly, with greater control on rougher, more technical trains. The suspension offers you a smoother ride by absorbing the shock of any obstacles on the trail. As with all mountain bikes, you should be expecting some good braking technology that operates in all weathers and conditions. Wheel size will affect what the bike is like to ride: bigger usually means faster but less responsive. In the article below we’ve surveyed five of the best value full suspension bikes. In each case, we’ve given you a short summary of their key features and then told you what makes them stand out to us. A great offering from Schwinn. 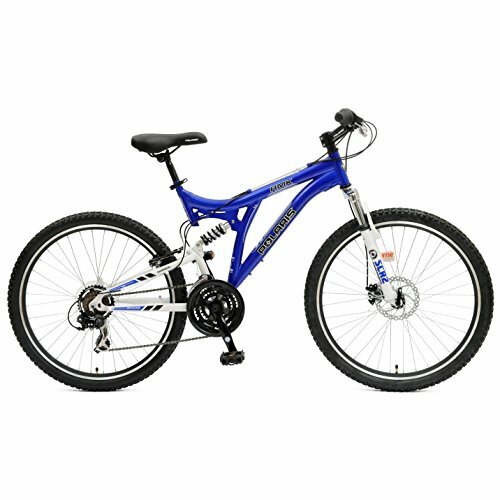 This bike has a dual suspension frame, meaning it is lightweight and can climb and descend easily. 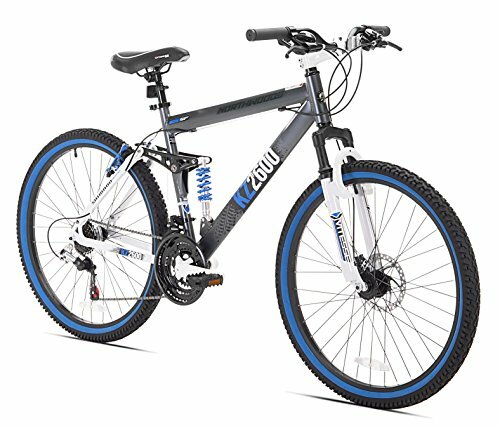 It has a 24-speed gear system, meaning that you’ll be able to get up the steepest of hills without to much trouble. Additionally, the gear system is made by Shimano, so you know you’re getting quality. It has a front disc brake and a rear alloy V-brake. This combination keeps the weight down while guaranteeing safe stopping in all conditions. It has an alloy crank which is durable and will need little maintenance. The tires are well gripped and supported by light and strong alloy rims. The wheel size is 26″ which is a compromise between speed and maneuverability. Why We Like It – This is a bike with all the features you would expect from a full suspension bike. 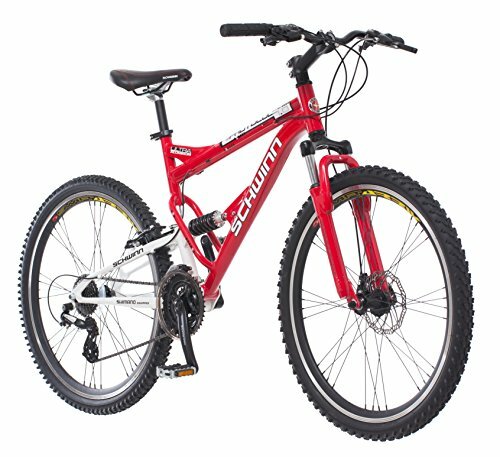 It’s got an aluminum alloy frame and will suit you well for starting to tackle some mountain trails. This bike features a strong aluminum frame that is durable without being too heavy. The frame is robust and well balanced which is essential for when you’re approaching mountain trails. At the rear, the bike offers a slightly different suspension mechanism to the Schwinn. It utilizes a floating beam design which is supposed to offer more progressive suspension. It’s adjustable and does get softer over time. At the front, a Zoom suspension fork is fitted with elastomer/spring technology. It has front and rear disc brakes so if the trails that you’re planning on riding are especially muddy, then that’ll be a big help. If appearance matters to you, this is probably the best looking bike we’ve reviewed: it comes in a matte black and blue. Why We Like It – This is a really well-balanced bike from GMC. It has a great frame and a good suspension system. The dual disc brakes make it perfect for tough conditions. 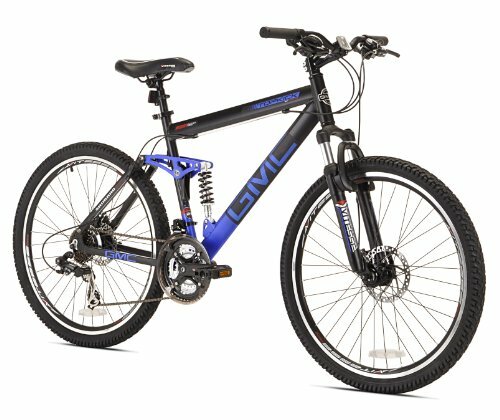 This is a good aluminum-framed cheap mountain bike with 26″ wheels and a floating beam suspension mechanism. It has a 21-speed gear system with Shimano shifter and a rear tourney derailleur. 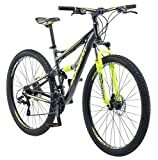 It has grippy mountain bike tires and durable alloy wheel rims. At the price, it represents excellent value. You’ll probably be surprised at how lightweight it is thanks to the aluminum frame. At 26″ inches, the wheels will give you a nice balance between downhill speed and responsiveness. They have 36-spoke alloy rims, guaranteeing a high level of durability. In terms of braking, it offers a front disc brake and a rear alloy V-brake. There is a quick-release seat post clamp, meaning that you can quickly adjust the saddle height if you like changing your seating position for climbing. Why We Like It – If you’re looking for an excellent value bike that’ll introduce you to the world of mountain biking then maybe this is the bike for you. The full suspension system will cushion any rough terrain and will encourage you to get out and about again and again. This is a fairly classic full suspension bike. At the rear, it has a traditional, single-pivot suspension system that is reliable and effective. With fewer moving parts, the single-pivot system has less to go wrong and less to repair if it ever does go wrong. This Polaris features a 21-speed gear system with a Shimano Mega Range cassette on the rear wheel. It had Shimano Revo twist gear-changing mechanism which some people prefer over the newer paddle system. The frame is steel, so it will be a little heavier than an aluminum-framed bike. If you’re tackling lots of hills, then do bear this in mind. It has a front disc brake and a rear linear pull. Included are reflectors and a kickstand, giving you that versatility for urban use. Why We Like It – This steel-framed full suspension mountain bike is very durable. It’ll see you through several years of trail-riding and mountain biking adventures. It’s a traditional design that has been tried and tested. This bike is made using 6061 aluminum alloy. It’s an aluminum alloy frequently used on bikes because it has a very good strength to weight ratio. The result is that this bike is surprisingly lightweight for what it is. It’ll see you up the sides of hills and ravines quickly. The wheels and tires are big: 27.5″. Their large diameter gives you a greater potential for speed when you’re riding. Their 2.125″ width balances this speed with stability and means that you’ll have a great grip on any surface you’re riding on. The floating bar suspension offers progressive suspension and, in combination with the front fork, will ensure that shock to your body is minimized, making for a more comfortable ride. It features twist shifters, minimizing weight and providing what is often a more straightforward method of changing gears. It has disc brakes front and rear for maximum braking potential. + Front and rear disc brakes. Why We Like It – It’s a full suspension mountain bike that has all the features you could want without being ridiculously heavy. It’s got a great aluminum frame that is durable and built to last. It’ll serve as a great way to explore new off-road tracks and trails. When making your purchase for a full suspension mountain bike, there are a few things you should consider. If you already know where you’re planning on riding it, then this will really help you make your mind up. Some features tend to lend themselves better to different situations. If the tracks you’re planning on riding are very technical and need a lot of quick maneuvering, then you should be looking at a bike with a smaller set of wheels, for example. Or if you live in a hilly area or want to go riding in one, then your choice of gear-system should be at the front of your mind. Below we’ve picked out some of the key components of a full suspension mountain bike and explained what to look for. A mountain bike frame needs to be strong. This is because it takes a lot of punishing on the trails. Because of this, you’ll either need a good aluminum alloy or steel. Aluminum is lighter, but steel is stronger. If you’re planning on really thrashing your bike around, think about steel. Otherwise, the lower weight of aluminum is a huge advantage, especially when you’re climbing. It does tend to be more expensive, so that’s something to bear in mind, too. In the bikes we’ve reviewed there are two suspension systems: the single pivot and the floating bar (also called the four-bar system). Both provide you with that all important back wheel cushioning, but they operate in slightly different ways. The single-point suspension is a much more straightforward system. It has a single shock absorber which cushions the forces from the rear wheel. Its main advantage is its simplicity. It has few moving parts and good small bump compliance. It can’t provide huge levels of extension without damaging the chain. Floating bar is an adaptation of the single pivot design. It operates in a very similar way, but it attaches additional linkages. Its advantage over a more straightforward single pivot design is that it offers more progressive, comfortable shock absorption. It is, however, a more complicated design and therefore has more components to go wrong. When you’re going quickly downhill in rocky terrain, you need to be able to stop quickly. Brakes are absolutely essential on mountain bikes. More than that, disc brakes are pretty much a must. All of the bikes we’ve reviewed have disc brakes on at least the front wheel. Disc brakes operate much better than V-brakes in difficult weather conditions. Sometimes V-brakes require one revolution of the wheel to clear them of mud or water before they start working effectively. Disc brakes are much more responsive. Two disc brakes might, therefore, be a better choice than one if you’re planning on riding in tough conditions. The downside is that disc brakes add extra weight. When it comes to wheels, it is important to choose something durable that can cope with difficult riding conditions. A big factor in durability is the number of spokes a wheel has. The more spokes, the more likely it will be to stay true. In terms of size, a bigger wheel will mean you can go faster. However, smaller wheels are easier to manipulate and are recommended when the downhill conditions are particularly technical and need responsive handling. For a mountain bike, a good gearing system is essential to enable you to climb hills and blast through muddy terrain. 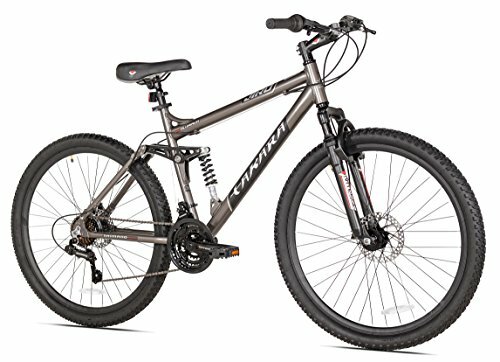 All of the bikes reviewed have fairly similar 21-24 speed gear systems which will offer you a high level of versatility. The one thing to consider is the shifters. You can either go for a twist or paddle mechanism. It’s a matter of personal preference, but some people find the traditional twist mechanism easier to handle and more responsive, particularly during uphill climbs. Once you’ve thought about where you’re going to use your bike, the next thing on your mind will really just be working out what you like. This might be a particular size of the wheel or even a particular look. Mountain biking is a great sport, and the more you do it, the more you’ll enjoy it. The sport is also very technology driven, so you want to arrive on the trail knowing something about the choices you’ve made. It’s worth taking some time deciding about your bike because you want to be confident in your decision. If you get a bike that you love, then you’ll love being out on it. This’ll mean more time outside, more fresh air, and more exercise. Happy riding!